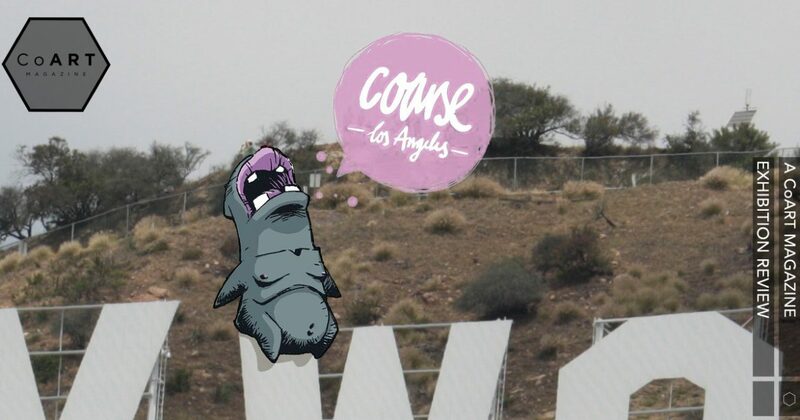 After the first day of DesignerCon this year, many of the attendees meandered across the street to the convention’s official party while others underwent a journey to Los Angeles’ Frogtown to be rewarded with Coarse‘s second L.A. open studio event. Though I wasn’t able to attend this year’s event, we enlisted photographer Jackson Davis to capture the evening’s festivities for us. With their workspace transformed into an open area for attendees, Mark Landwehr and Sven Waschk were joined by frequent collaborator Amanda Visell, all three conversing with collectors, happily signing works and sketching for those interested. And, as an added treat, specially made lollipops depicting Coarse’s raccoon character’s head were offered for free. Debuting at the Coarse Open Studio 2016 was a new edition of the Last Days of Autumn vinyl sculpture (see video review here), one that is based on the colorations of the Amanda Visell handpainted resin version displayed at the 2014 Stroke Art Fair in Munich, Germany. Foregoing any of the blue-tinted area of the previous editions (both 2015), this new version — retitling the work Chop Chop (2016) — makes the concept all the more disturbing: no longer is there a sense of an impending winter that the kids need firewood to survive, rather their assult on the tree can be seen as an act of joyful maliciousness. And to celebrate this new release, Visell created five handpainted resin Chop Chop Arcade (2016) sets, each a disturbingly brilliant accompaniment to the Chop Chop piece. Depicting a video game, titled Chop Chop, that appears to encourage the player to assault the sentient tree character with their ax-weilding little girl character. While Visell has previously handpainted unique copies of Coarse’s Omen (2013) and Cancan (2015) pieces, I believe this is the first time she has lent her aesthetic to the Kwaii (2016) vinyl sculpture. The three pieces are titled Tragedy, Denial, and Catastrophe, each transformed with painterly strokes into singular expressions of Visell’s artistry. While most of the remaining Coarse works are from their recent Cold Ways: Nights that Haunt the Past solo exhibition, I did want to highlight three works: Do You Remember?, I Need You, and How Could I Forget? (all 2016). In talking to Sven Waschk about this series, he referred to it as Chronophobia, meaning the fear of time, which is a wonderfully apt title. Depicting the duo’s The Void character from The Passage set (2014) looking on, each of these resin works features a young adult and elderly version of the same human character simultaneously on a standard playground piece, like a seesaw or swing. Do these indicate a Peter Pan effect, with the youthful actions making one truly feel younger? Or do they rather speak to the opposite, how we all grow older no matter what we do to feel otherwise? Like all truly memorable works of art, the interpretation is up to the viewer. Coarse’s Open Studio 2016 was a one-night event on Saturday, November 19th, 2016 from 7 to 10pm at the artist’s Los Angeles studio space (2940 Denby Avenue, Los Angeles, CA 90039).